Go on, make my day! Cheap can sound pretty good too, you know. Well, speakers we certainly don't lack, we have them coming out of our ears. But somehow, there's always someone new just around the corner, with a sound concept all of their own (pun intended). And that's good, I think, because it makes our choice wider still, no bad thing in a world dominated by fashion. B&M Acoustics is just such a new company. It was founded only a year ago by two enthusiasts, one of which fortunately had the money for the venture. The other one is a speaker designer with no formal degree, but with obvious talent for it. The first one‘s Christian name is Blaza, and the second one's name is Mirko, so together they went into the deal and called themselves B&M Acoustics. One of their operations is to represent Son Audax in Yugoslavia, so you won't be surprised to learn that all their speakers are based on Audax drivers. On the bright side, I believe Audax has if not the largest, than at least one of the largest driver portfolios in the world, so your choice is essentially limited by your desires and your budget. During that one year of operation, B&M has managed to introduce a truly stunning number of models, divided into three series. Under test here, we have their most affordable series. 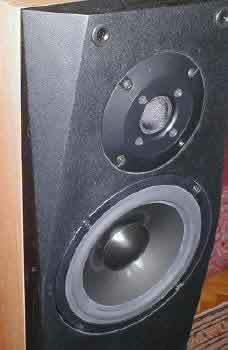 Model AP17 is a floorstanding design, using a two driver complement. Oddly enough in view of the price, the drivers themselves are very serious units you would not dream of expecting to see in such a modestly priced speaker. The mid/bass unit uses Aerogel (HDA - High Definition Aerogel) for its cone material, in a 170 mm (6.5 inch) cone; much play has been on this material elsewhere (e.g. Mission, Kelly, etc). It is said to be extraordinarily light, yet stiff, and due to its internal honeycomb structure, with outstanding self-damping characteristics. This should allow for excellent control and resolution, with little overhang, plus better than usual efficiency. Its Audax catalog designation is AP170Z0. The tweeter (TW025M2) is what I believe to be one of Audax's best tweeters ever; that I'm not alone in this belief is best demonstrated by the fact that you will find it in quite a large number of well known and respected British speakers. It is a 25 mm (1") textile dome, in a small horn loaded chamber, with high impact polymer fascia, using ventilation with double damping (front and vent). It uses copper clad pure aluminium braided wire voice coil, with a felt damped rear chamber. Consequently, its power handling is extraordinary, at 100/180W with a 2nd order crossover at 2/3kHz. But more important, its response is fairly smooth to beyond 20 kHz, not at all easy to achieve. The drivers are bound together by a passive network crossover, using commercial quality parts, and ultimately forming 18 dB/oct. slopes at 2.8 kHz. This is about the limit of usability of the mid/bass driver, as it starts to break up above 3.5 kHz. Efficiency is said to be 89-90 dB/1W/1m, nominal impedance 8 Ohms with a minimum of around 5 Ohms, in both cases +/- 0.5 Ohms. Incidentally, this is the first time I ever saw a tolerance of impedance being mentioned. 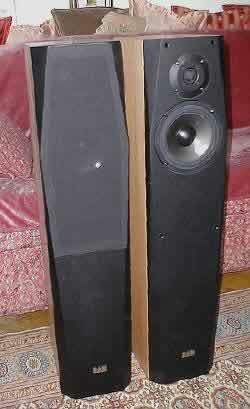 The speaker stands 91x25x19.5 cm (36x10x7.7 inches) HxDxW, excluding the grille (which I never include unless flush mounted). On the back, you'll find the reflex port and a pair of binding posts just above it - no biwiring, no biamping here. Hard as this may be to believe, but the wood finish uses real wood. My sample was finished in teak, but many other finishes are also available at request, including gloss white, oak, yew, cherry, mahogany, and - aha-ha! My favorite! - piano black. Of course, you pay extra for other finishes, but price differences are rather small, usually an extra 2-10% of the basic price, piano black being the most expensive. On the bottom, you'll find four small metal "feet"; while they can be used as feet, their elevation is about 3 mm only, and you'll quickly notice these are also receptacles for screw-on spikes. Spikes are available in several qualities and finishes as an extra, left to the buyer to decide at once or later. Well, the one thing that you notice on the first notes of whatever you are playing is the resolution. It doesn't just pop up, it slugs you between the eyes. Everything in the broad midrange seems very well defined, but not actually sharp or in any way obtrusive. Female voices are crystal clear, male voices have a timbre you won't find in many places at this price or somewhat above it, free of chestiness and overhang. The treble range is also clean as a whistle, coming across as very natural, with good natural decay and excellent dynamics. No fizz, no sheen, just whatever's in the music material. Subjectively, there's a feeling of speed and ease of operation, in no small part due to excellent power handling, I believe. The bass lines, on the other hand, while present, are not what I expected. They are clean, to be sure, very fast and well defined, but lacking in weight and authority. Somehow, the whole seems smaller than its physical dimensions, but please bear in mind here that I went to them after my own AR94, which are much bigger, have two 20 cm (8") long throw bass drivers and can grunt like few others if necessary, in addition to which they are of acoustic suspension type, and consequently have smaller phase shifts in the bass region than most reflex types (which subjectively appears as clean, deep bass). Play it loud, and this speaker more or less maintains its integrity, with no obvious breakups anywhere. A little yes, here and there you can hear it, but once more, for the asking price, this is insignificant. But it will lack authority and weight, and playing loud, will cause you to feel that the speakers are a little insubstantial. I know that despite their substantial appearance, these speakers have effective volumes of only about 28 liters, but I still missed some deeper bass notes. In return, the mid and treble ranges held together very well, never losing it for a second. No breakups, no false sheens, and always that speed and definition, never failing all the way up to its maximum rating, when first signs of serious breakup and gross distortion begin to appear. But by then, your windows panes are well into the rattling range. Also, you will feel the treble sting if the music calls for it, something I don't often have the opportunity to hear, at least not so cleanly. The brushes for example will sound very life-like, with that characteristic metallic sound they are supposed to impart, yet you will never doubt that they should sound exactly like that. A good point that, and one I enjoyed much, probably because I don't get to hear it too often. But ambient types of music, like chamber quartets for example, benefit the most from this speaker at louder volumes. It is possible to attain most live levels with even relatively modest amps (see list below), and this brings out the best of the Aerogel, it seems. Ambience content is unusually high, you can almost feel the room around you and the artists in front of you. Classic guitars, like Paco de Lucio for example, also come across very convincingly. But Manitas de Plata really won my heart - his fast guitar riffs are exceptionally rendered by the Aerogel cone, you could almost smell the cheap booze and touch the man. Classic music does well also, but here the lack of true deep bass may appear to be a limiting factor, if for example the tympani are used. But the speaker will not come to the typical complex music muddle most speakers seem to demonstrate before you are well into high power territory. Then, it will start to fold up on you, but I say it again, by then, you'll very likely be in serious trouble with the neighbors. 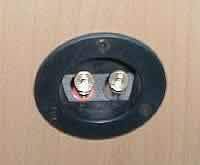 We all know that the amp-cable-speaker relationship is a complex one, as in any family. So, to be on the safe side, I tried these speakers with three different cables and three different integrated amps. With the Yamaha and the Rotel, Jamo's OFC speaker cable produced wooly results, and with the HK 680 the sound became obscured. So I dumped it. Using Van den Hul CS122 cable (silver plated OFC copper and carbon fibre hybrid, 3.5 mm / 0.14") gave a thin sound with the Yamaha AX592, also a thin but better defined sound with Rotel's RA-931 Mk.2 integrated, and a better balanced sound with HK680. Finally, Van den Hul's 352 Hybrid (same as CS122, but 5.5 mm / 0.22"), a warm sounding cable anyway, brought things to a rather nice level. The Yamaha was still a bit thin, as was the Rotel, by with the HK 680 some deeper bass appeared. However, all three amps had no problems in controlling the speaker, an indication that the load is as the manufacturer says it is, allowing all three amps to enjoy damping factors of around 100:1 or better. Definition was never in question. Inserting SoundCare spikes under the speakers improved matters a little, mostly in the cleared up spectrum, a sort of overall, top to bottom, wiping off the dust, as it were. Not spectacular, but it could be noticed in slightly improved overall control. This is a stunning speaker - for the price. Actually, its by far strongest point is its extraordinary cost/performance ratio. It doesn't do anything terribly wrong, it does show a lack of deep, authoritative bass which can be exasperating at times, but what it does, it does well, and sometimes better. Midrange definition and clarity are excellent for speakers costing three or four times the money, and the treble is pretty much like that as well. Looking over the driver price list, I completely fail to understand how on earth did they manage to build so much into the speakers at such a price - though by the time the speakers reach you via retail trade, their price will more than likely double. Let's be practical here and assume for the moment that its retail price in a typical EC audio shop will be double the factory price, i.e. $400. Even so, even with the much more aggressive competition in that price bracket, this is still an exceptional speaker. Exceptional here means it will still offer an outstanding price/performance ratio - how many other floor standing speakers in that price range do you know of which offer real wood veneer and 255 mm thick front fibre board? I can't think of one, maybe you'll be luckier. AP17 does not shine anywhere, though it is very good to excellent in broad midrange definition and clarity, and its treble rendition is rare in that price bracket, and unheard of in its factory price bracket. The sheer driver quality in an entry level speaker, which to add insult to injury is also a substantial floorstander, is amazing. Their sound is unexpectedly good for the money. Their looks are a matter of taste - I was not taken by the design, but it is modern and you may feel differently. Anyway, make up your own mind from the photos. The fact that you get a standard of build which you would normally have to pay much more for is also a plus. However, while reasonably good, the standard of finish could be improved - but this would also jack up the price, I know, and this is an entry level speaker, after all. I would advise you use warmer sounding cables with it - you will still have their clarity, but will also add a little spice to what may otherwise be a somewhat antiseptic tonal picture. The same goes for amps - use a bright sounding amp and the overall balance will shift towards the bright. It's not easy finding a gutsy amp for $200 or thereabouts, I know, but my point is go for controlled designs, not loose cannons. Marantz PMA4000 comes to mind as a likely alternative, Rotel's RA-931 Mk.2 is another, though it will not bring out the best of bass lines. I'm sure there are more. But overall, this is a competent design from a young company, its entry level model. As such, it uses drivers of very good quality, real wood veneer (and to choice, as well) and considerable size which are hard to understand for the more than modest factory price, and probably still a modest price in standard retail. At this time, I am told B&M Acoustics exports to Austria only, but they are looking for dealers elsewhere. So, in conclusion, we have an above average speaker, in some respects competing with much more expensive and better known products, for a below average price. Even if the price is doubled, assuming typical shipping costs and customs duties, it will still stand tall in good company. In my book, that's called a job well done. We of B&M Acoustics would like to thank TNT for the review of our entry level series model AP17 loudspeakers. We anticipated a fair test, as we have come to expect of TNT, and we were very pleased with the results, as any designer/manufacturer is when he gets a good review. Discussing tonal balances is really pointless, as this is a matter of personal taste and specific systems used, but we note that what we set out to do seems to have been achieved. Our objective with this model was to produce a budget class speaker which would not have the usual two problems of most such products - it must not sound either congested or shut in, nor must it be too bright. In both cases, we feel good definition and focus will have been seriously compromised. Of course, an inexpensive speaker will necessarily make many a compromise, so our AP17 is really our view on how and where such compromises should be made. We decided to use quality drivers and real wood veneer; an inexpensive speaker will be just as much a part of a room as an expensive one, and just because somebody cannot afford an expensive speaker should not mean that he/she must also endure vinyl where real wood should be. We would also like to remind readers of TNT that we do offer two entire series of speakers above this one, where the compromises made go down, but the price goes up. Our high end speakers, while much more costly than AP17, but still much more affordable than competing products, show how many compromises can be resolved to a good end. We will be glad to submit them to TNT for testing. In closing, we would like to complement TNT for being what it is, notably two important things. First, it is an audiophile site for audiophiles with no commercial background, which inspires our confidence and probably every other small manufacturer's confidence as well, because the simple truth is we can't compete with big names on any commercial basis (ads, ad campaigns, giveaway contests, etc). Second, TNT has given us something we value highly, a look into the world of audio from all parts of the globe; for example, if not for TNT, we would not have heard about nOrh, and people would have heard about us so quickly.